This is the story of internet media, marketing and technology from the perspective of Martin Pavey, founder of Eric & Rolf. From coming up with YouTube before they did (almost) to streaming video over dial-up modems, I grew up with creative and digital technologies and helped build two hugely successful businesses. Digital is at its best when people collaborate. Creativity and innovation are vital components of a successful business. As is crisp, clean copywriting. In the late 1990s the internet kicked off, just as broadcast media went digital for editing and post production. Working at a Soho film company an idea came to mind… for a searchable video website where you could watch any video. After learning html, design and video encoding it went live with the film company’s content. Production Solutions magazine made it website of the month, “…it is rare to have a site such as this that combines usefulness, ease of use and ‘wow’ factor.” Meetings with investors soon followed but without broadband it was too soon. The passion for online creative innovation and technology started here. In amongst the Steenbeck film editing machines and broadcast tape formats sat the TV-am archive. It was time to experiment with digital video editing and Macromedia Flash – but it didn’t support video in 1998. Getting RealPlayer video to work with Flash was a challenge. But challenges are good. Unfortunately Roland was disappointed – he threatened to sue unless the site was taken down. It was time to move with the times, from broadcast to digital media. 2001. The internet boom and a role in digital ad tech startup Tangozebra, the first UK ad server and specialists in rich media and video. The Guardian is already asking, “How bad can banner ads get?” This is the start of a belief that for advertising to be effective, the creative idea and strategy is every bit as important as the technology that delivers it – or the media it is placed in. 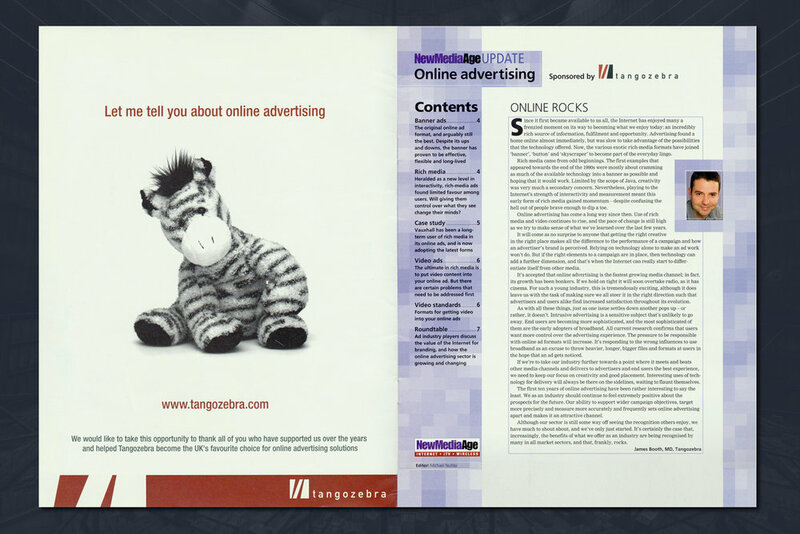 Led by James Booth, an inspiring internet pioneer and rightly famous chap in the UK digital media scene, Tangozebra was a cutting-edge company at a time when creative and tech innovation broke new boundaries. It’s when Google and Facebook started to build momentum. Tangozebra created award-winning technology, a strong business and a team of great people. Having successfully expanded into Europe in 2005 and winning multi-channel ad server clients, the company was acquired by DoubleClick (Google) in 2007. The knowledge gained here built the foundations of my expertise and enthusiasm for digital marketing and its creative potential. It’s not easy to grow a tech business. DoubleClick got there first when it came to global infrastructure and software, enabling media owners to monetise digital media as print declined. A new advertiser- focused version of DoubleClick allowed the buyers of media to analyse results across multiple placements and channels all in one place. That was genius. Today most agree you should not audit what you spend with software from the company you are buying from. But this was before Google created their own programmatic media buying tool by acquiring Invite Media and eventually rebranding it DoubleClick Bid Manager. You learn a lot working in product management for a multinational company. Particularly when your boss is another key man in the story of digital media, Ari Paparo. He wrote the code that became the standard for video ad serving. What is now called Over-the-Top (OTT) video was called Video on Demand (VOD) in 2007. It’s when BBC iPlayer and other major TV channels launched streaming services. From the commercial perspective video ads started appearing in front of content, called pre-roll or in-stream. The broadcast industry needed a solution to move TV ads onto the internet at scale. The best in the business at global TV ad distribution is GroupIMD, led by smart CEO Simon Cox. I spent an informative year learning about the TV advertising industry and expanding their knowledge of online ad technology, workflows and business models. The iPhone changed everything. Steve Jobs is largely responsible for the way online audiovisual content and advertising must be produced, delivered and measured today. “Apple hates Flash, Google hates Flash,” Rich Atkins at BBH pereceptively said to me. It used up battery life, slowed down web browsing and it was now owned by Adobe. Navigating the nuances of mobile advertising and the app environment would be the next innovation and business challenge. Data driven. The two words that encompass the second phase of growth in online advertising and marketing. The advent of programmatic media – the ability to buy ad space based on a stock exchange-style trading model of bidding on all available inventory – started the hunt for ‘data sufficiency’ and the process of data becoming a corporate asset. What if you could pair all the data you legitimately held about users with real-time buying methods? This was the beginning of the personalised online advertising we see today. But it needs work. The ads that follow you around are a turn-off, as is much of the creative. A somewhat cavalier approach to data contributed to the Facebook / Cambridge Analytic debacle and our new found friend GDPR. The regulatory bodies just need to get it right. Flashtalking is the UK’s leading digital marketing platform, understanding how to use data responsibly to create sophisticated personalised advertising. Founded by Paul Cunningham and Dan Freeman, I helped build it into a successful digital business, growing from twenty people in the UK to a global staff of three hundred across the US, Europe and APAC. It goes from strength to strength and is now led out of New York by digital pioneer John Nardone. He founded the IAB and is the man who placed the first ad on the internet. By 2018 digital marketing is sophisticated or complicated, depending on your point of view. It’s probably both. Google and Facebook have become hybrid media-tech companies, offering ‘full stack’ services in an attempt to secure as much of an advertiser’s budget as possible. Traditional media companies and indeed other verticals are running to keep up. We are on the cusp of all advertising media delivery being connected to and driven by data signals in the way online has matured. This is what all the excitement around ‘addressable’ advertising in TV and Digital Out of Home (DOoH) is about. The platform that can do all of this will be valuable, as long as it is trusted. Marketers and consumers have realised their data is a valuable commodity and need transparency. The marketers don’t want a one-stop solution, they seek flexibility, a genuine audit paired with data portability. Adobe partnered with Flashtalking to accomplish this. From the consumer point of view, GDPR and the regulatory bodies will provide the necessary reassurance that will see digital maintain its position at the heart of advertising.